HUGHESY and Kate's executive producer has spilled the beans about what the radio duo are really like behind the scenes. Sacha French joined Hughesy and Kate as their executive producer back in 2001 when they started hosting the Nova breakfast show in Melbourne and she's been with them ever since. Now hosting the national drive show on the Hit Network, the duo are considered one of the most successful radio pairings in Australian history and are as popular as ever. And they owe a lot of their success to their executive producer. "I had actually just moved here from the UK where I was running a radio station," French told news.com.au about landing the producing gig. "I went for an interview and the program director for Nova in Melbourne at the time was all excited and arranged a secret meeting. He said, 'you're going to be so excited when you find out who the people are.' 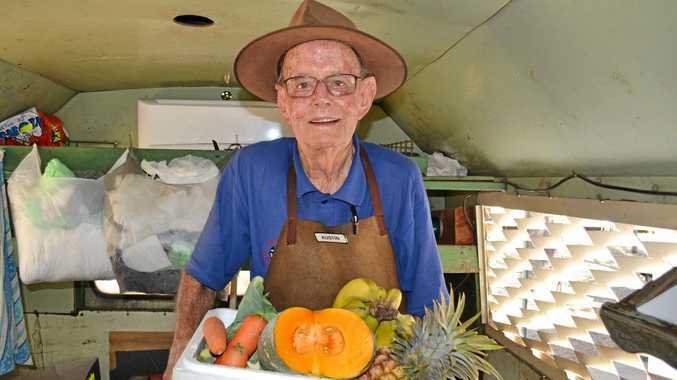 But because I wasn't from Australia I had no idea who Hughesy and Kate were." 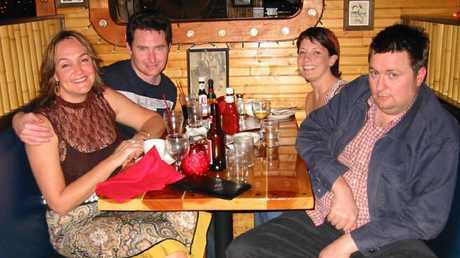 Early days: Hughesy and Kate with their producer, Sacha, and Dave O’Neill. 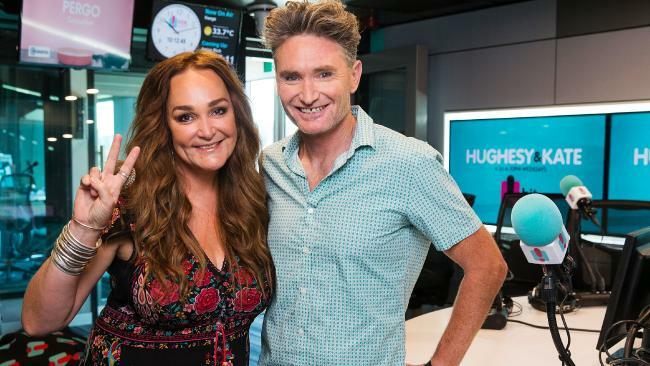 When French eventually met the duo, she found Kate Langbroek to be "larger than life" and described Dave Hughes as "slightly awkward". "It's funny to think how he's changed over the years," French said about the comedian. "Hughesy was more quiet back then. His thing back then was being the awkward country guy and now he's so experienced. Even in just general conversations with people he's less awkward now." As executive producer of Hughesy and Kate, French has to be across every single aspect of the show, both what's happening on air and what's happening behind the scenes. "Hughesy lives such a busy life with his TV show and his comedy touring so I spend a lot of time chatting to his manager so I know where he is and getting my head across how tired he's going to be the next day," French told news.com.au. "They're things that impact the show and the content and how we all work together so as a producer I think it's really important you're across all of that. It doesn't just stop at what's happening inside the radio station and on the show that day." Over the years the three of them have become great friends and French knows exactly what things will delight her hosts and what small things will fluster them. "For Hughesy it would be headphones," she said when asked what can rattle the radio duo. "He really gets thrown if the sound's out or if there's a slight buzz. If he's broadcasting from interstate we have to make sure it's a quality line and he can hear the callers on the show. It's always been like that with him." And as for Langbroek, "food makes a difference for her," French said. "If you're hungry and you're doing a show, that will distract and impact the quality of the show and it's an easy fix. 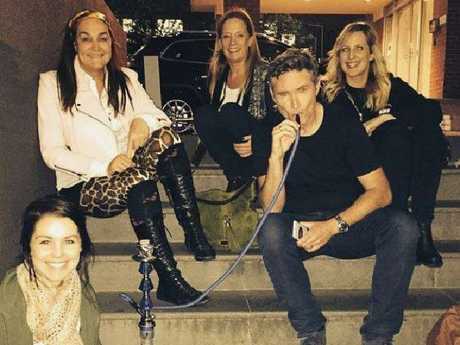 The Hughesy and Kate team chilling out after a show. "Last year I wold hate to see what Hughesy spent on Uber Eats. He'd come in and say, 'I'm getting lunch. Who wants lunch?' He'd buy lunch for everyone in the team and bags of Uber Eats would turn up every day. They're both very generous with the entire team." It's that generosity that last year resulted in one of the standout moments from French's time with Hughesy and Kate. "It was so overwhelming and unexpected," French said about the pair's on air surprise for her that changed her life. "I'd never told them about my student loans in New Zealand ... I'd borrowed $41,000, I'd paid back $53,000 and I still owed $80,000 because they charge interest when you live overseas. "I told Kate about it early last year because I thought it could be good content because loads of New Zealanders I'd met aren't paying their loans and they're not allowed to go home to New Zealand because of the student loans. "On my birthday last year we were in the middle of a show ... they were like, 'Sacha, come into the studio.' I panicked because I'm a control freak and I had no idea what was happening. "They'd written me this beautiful card which made me cry ... and then they told me they were going to pay off my student loan. They paid off the $80,000. I can't say thank you enough because I never thought I'd be able to pay that off. It was amazing." Hughesy and Kate with their producer, Sacha. When speaking to French it's clear there's a lot of love between her and her co-hosts, but she happily admits there can sometimes be tension in the team. "Kate loves pranking Hughesy and Hughesy will constantly yell at me directly after a prank telling me we've gone too far this time," she told news.com.au. "Once we sent up a drone with a video camera up outside his house early in the morning. It filmed him as he was coming out of the bathroom naked. He rang me after that and said we'd gone too far but the great thing about both of them is that they love anything that's going to be great content for the show. Once he gets over that we've gone too far he starts to see the great content it will make and then he loves it." 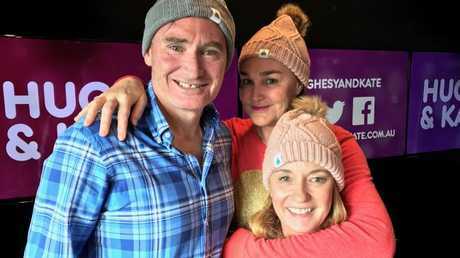 It's that eye for content that has made Hughesy and Kate one of the most loved shows on radio. But in French's opinion, the pair owe most of their success to their relationship with one another. "They have such respect and they love talking to each other, both on air and off air," she said. "They genuinely enjoy surprising each other on air with content and their chemistry, you just can't manufacture that."